It was at 1:45 p.m. on April 17, 1969 that members of the NAL Linac Section obtained a beam of protons from the preaccelerator, the first and smallest of four cascaded accelerators which will comprise the complete 200 BeV accelerator. The preaccelerator includes an ion source to produce the protons, and an accelerating column to give the protons a speed of four percent of the speed of light and a kinetic energy of 750,000 electron volts. The interior of the column under vacuum, one foot in length, withstands a voltage of 750,000 volts across it and operates in principle like the accelerating portion of an electron gun in a television picture tube. Design, fabrication and testing of the preaccelerator to the present time has been primarily the responsibility of Cyril Curtis, physicist; Glenn Lee, mechanical engineer; and Charles Sharp, Gregory Urban, Raymond Hren and James Wendt, technicians. Many other persons in the Linac Section and elsewhere have made important contributions in bringing the system to its present stage of completion. A part of the construction was accomplished in the Physical Science Laboratory of the University of Wisconsin. 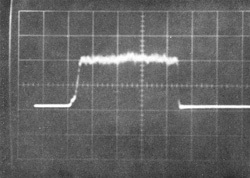 The assistance of Argonne National Laboratory in the loan of their high voltage supply, while the NAL supply is under construction, made the early testing of the preaccelerator possible. Protons are produced in the ion source by striking an arc discharge in hydrogen gas. The single negative electron is thereby stripped from the hydrogen atom leaving the positive nucleus, a proton, to float freely in the resulting plasma Application of an electric force field extracts protons from the surface of the plasma and sends them' on their way as a stream of positive particles. Operation of the ion source first occurred m .January 20. Bean currents up to 300 milliamperes were obtained. To elate a current of approximately 50 milliamperes has been accelerated through the column to 745,000 electron volts of energy during initial testing The goal is a beam current of 225 milliamperes with highly directive properties for injection into the Linear Accelerator (Linac). The properties of the beam from the preaccelerator are important in influencing the "quality" of the beam at all later staves of acceleration in the Linac, Booster, and Main Ring. At the highest energy there is a memory of the beam properties from the preaccelerator, with little that can be done to improve, albeit much that can be done to degrade, the initial beam quality. Effort therefore, will be devoted during the coming months to beam measurements and ion source adjustments for achieving the best beam quality. LINAC ACHIEVES HIGHEST PROTON BEAM ENERGY IN U.S. It seems that nearly every week brings news of another significant milestone in the development of the NAL accelerator system. At 1:50 p.m. on Thursday, July 30, the Linear Accelerator Section staff recorded still another major triumph in its continuing record of achievements. At that time, a proton beam in the Linac was accelerated to 66 Million Electron Volts (MeV). It was the highest energy yet achieved at NAL --- and, more notably, it was the highest energy ever achieved in a proton linear accelerator in the United States. Only the Linear Accelerator at Serpukhov, near Moscow, in the Soviet Union, has a proton beam with energy higher than that at NAL. It has achieved 100 MeV. Donald Young, Linac section leader, said that the NAL beam was accelerated through the first three linac tanks, which NAL and contractor staff have been busily installing in recent weeks. Principal contractors aiding the NAL staff were Borg, Inc., pipe-fitters, and A.S. Schulman Electric Co.
"Physicist Cy Curtis has coordinated the operation. However, it is important to note that every one in the Linac section was in on this effort," said Young. Measurements of the beam properties are now in progress by the Linac Section staff -- that is, they are analyzing the emittance, energy, amplification of phase and amplitude of cavity voltages. An informal observance of the event was held in the Linac building on the Main Site. Sometime in early October, the Linac Section will seek another record. The objective then will be a 139 MeV beam. This beam will be achieved by the linkage of six tanks in the Linear Accelerator enclosure. If successful, NAL then will have a higher energy beam than any other proton linear accelerator in the world. At present, the first three tanks and radio frequency systems of the Linac are complete. In addition, drift-tube alignment is almost complete in tank number five. All sections for tanks 6, 7 and 8 have been delivered and the last sections for the last tank (number 9) will be delivered shortly. Work also is proceeding on schedule on installation of the remaining RF systems for the Linac. On Sunday afternoon, December l, 1968, ground-breaking ceremonies took place on the NAL site. The ground-breaking was for construction of the Linear Accelerator Enclosure. Glenn Seaborg, Chairman, U.S. Atomic Energy Commission, AEC Commissioner James Ramey and Congressman Melvin Price, of Illinois, were among the participants in the ceremony on that cold, snowy day. While construction crews rushed to complete the first permanent structure at the Main Site, the Linac Section, directed by Donald Young, worked in temporary laboratory buildings in the NAL Village to design and re-design various elements of the linear accelerator. They were among the pioneers, both literally and figuratively, at NAL. The linac enclosure was completed at the end of December, 1969, and the Linac Section began its move of manpower and equipment to its new and permanent home, well ahead of schedule. On January 15, 1970, the Village Crier reported: "About a year from now, the Linac Section hopes to be celebrating the arrival of a 200 MeV beam from the linear accelerator." The Cockcroft-Walton preaccelerator, to provide the first stage of proton beam acceleration in the NAL system, had been imported from Switzerland and was tested in early months of this year. At 1:50 p.m. on Thursday, July 30, 1970, a proton beam in the Linac was accelerated to 66 Million Electron Volts to achieve the highest energy yet recorded at NAL. At 6:00 a.m., Friday, October 9, 1970, a proton beam was detected in Station A-3 of the Main Accelerator. A beam had been accelerated previously to 139 MeV in the first six tanks of the Linac on Friday, September 25. This beam was then guided through the Booster and injected into the Main Ring. The next two months were feverish and productive ones in the Linac Section as physicists, engineers and technicians pressed to achieve the full design energy of the NAL Linac of 200 MeV as soon as possible -- hopefully before Thanksgiving Day, but certainly before Christmas. They worked to assemble the final three tanks into the Linac system. The RF systems were operated at increasingly higher power. Protons are being accelerated through Linac's nine cavities for the first time at 200 MeV. 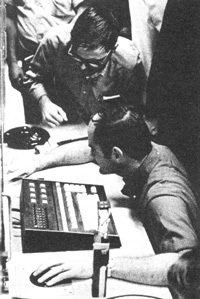 Here, at the control console, are (above) Robert Goodwin and Mike Shea. At about midnight, Monday, November 30, the proton beam was accelerated through the Linac's nine cavities for the first time. 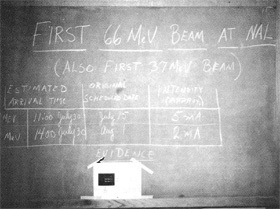 Shortly after that -- Tuesday morning, December 1 -- the protons were accelerated through the analyzing magnet into the beam dump at 200 MeV and this process was continued for about 15 minutes while both a photographic and a data processing print-out record was made of this historic event. Robert R. Wilson, NAL Director, and Edwin Goldwasser, Deputy Director, joined the Linac staff to toast those present with champagne and to celebrate the occasion, which literally took place on the second anniversary of the ground breaking for the Linac enclosure. 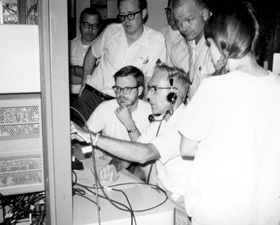 Among Linac personnel on hand were Leon Beverly, William Carl, Cyril Curtis, Anthony Donaldson, Wayne Ganger, Robert Goodwin, Edward Gray, James Hickey, James Hogan, Raymond Hren, Robert Kocanda, Santo LaMantia, Glenn Lee, Robert Mau, Daniel Matias, Frank Mehring, Curtis Owen, Maxwell Palmer, Reid Rihel, Michael Shea, Donald Tokarz, Gregg Urban, Lester Wahl, James Wendt, Roy Wickenberg, Eugene Woods and Donald Young. 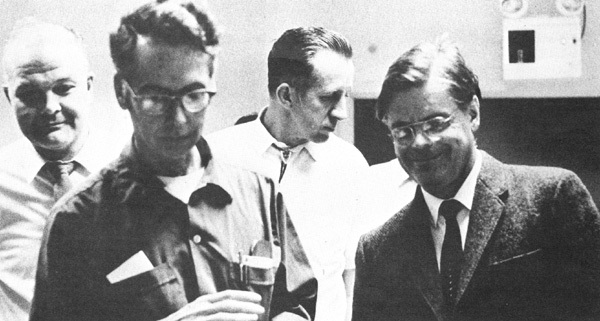 Edward Hubbard, Booster, and Harry Howe, Radiation Physics, were also present. "It was a combination of teamwork and planning that helped us to make this achievement several months before we had planned for it originally," said Don Young. In the months ahead, we will devote much of our time and energy to tuning up the system so that we will be able to transmit more protons with better quality toward the Booster." 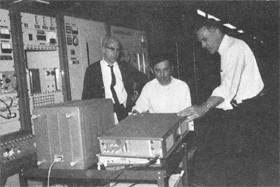 Development of the NAL Linac was the result of teamwork, too, with the AGS Conversion Group at the Brookhaven National Laboratory on Long Island in the State of New York. There, the 200 MeV linear accelerator designed by Brookhaven's group reached its full design energy on Wednesday, November 18, at 1:44 a.m., only about 12 days before the NAL accomplishment. So now the world has two 200 MeV proton linear accelerators -- and both of them are in the United States.